Kevin Thomas, left, Four County Career Center’s Law Enforcement and Security Tactics instructor, along with Jared Sanchez, right, spoke to the Criminal Justice Student Association at Bowling Green State University about law enforcement training and career opportunities. Alex Miller, center, CJSA vice president, extended the invitation. Miller and Sanchez are graduates of the FCCC program. Miller is currently a military police officer in the Ohio National Guard and a Criminal Justice student at BGSU. Sanchez is a Stryker police officer. 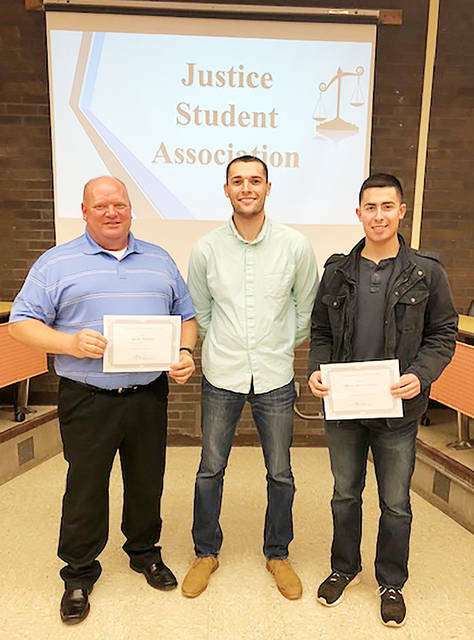 https://www.fcnews.org/wp-content/uploads/sites/45/2018/11/web1_FCCC-law-enforcement.jpgKevin Thomas, left, Four County Career Center’s Law Enforcement and Security Tactics instructor, along with Jared Sanchez, right, spoke to the Criminal Justice Student Association at Bowling Green State University about law enforcement training and career opportunities. Alex Miller, center, CJSA vice president, extended the invitation. Miller and Sanchez are graduates of the FCCC program. Miller is currently a military police officer in the Ohio National Guard and a Criminal Justice student at BGSU. Sanchez is a Stryker police officer.